You see this tiny chip in the image above? This wireless sensor. One day, the doctor will practice its implementation in our body to monitor the performance of our bodies. Moreover, these chips will allow once paralysed and amputees to manage their new artificial limbs. Development of the first prototype of this device the size of a grain belongs to scientists from the University of California at Berkeley. Each such sensor includes a piezoelectric crystal that converts ultrasonic vibration energy. Due to this power unit is capable of transmitting on the resulting device, for example, information about the work of nerve cells in the brain, which will be used to control bionic limbs. Despite the fact that the current version of the sensor measuring just 3 x 1 mm (including the cubic component), a team of scientists said that in the future, the device is still reduced in size. 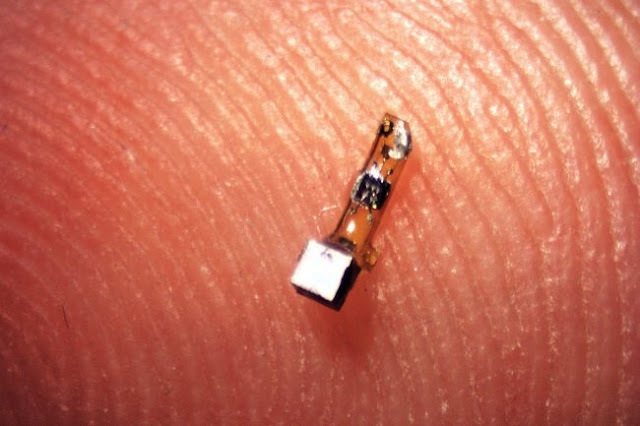 Ideally, it is planned to create a sensor the size of half the diameter of a human hair. Such devices, according to experts (calling them "neural dust"), will always work within our bodies. Through these chips need of prosthetic limbs for people not to have to resort to the use of implants with a bunch of bulky electrodes. next generation of interfaces" brain ­ computer "and make this technology viable. Such chips, after implantation in the brain, will enable people suffering paralysis, the power of thought to control, such as a computer or a robotic arm. And this opportunity will remain for a lifetime. " The research team believes that in addition to the control of artificial limbs and monitoring of bodies, such sensors can be used in the treatment of a variety of tumors, including cancers. In addition, it is possible that similar chips will be used for the stimulation of the nerve cells and muscles and prevent symptoms of epilepsy. Of course, before the advent of such facilities will take time, however, scientists have conducted a successful test of this chip prototype (pictured above) in laboratory mice.